A joint release from Big Boi and Phantogram has been in the works for a long time. Last month, the rapper suggested the music was finished in an Instagram post. The collaborators also performed together at Epic Fest. Now an EP titled Big Grams is officially on the way, scheduled to arrive September 25. According to an interview with Pitchfork, the project came about in a very 21st century fashion. "I stumbled upon Phantogram through a pop-up ad on my computer," Big Boi explained. "I was closing out screens and then a pop-up ad came up and it had their song 'Mouthful of Diamonds' on it. 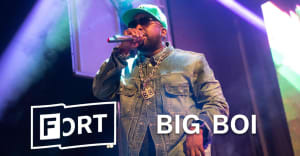 I Shazamed it and bought it on iTunes, and ended up putting it on my BigBoi.com website as the jam of the week. I guess they caught wind of it and reached out to me." Phantogram's Sarah Barthel added, "We're an Aquemini, too, because Josh is a Gemini and I'm an Aquarius and we felt like that was a connection on another level."